Dril-Quip extends its considerable expertise in specialty connector design to include drilling and high-pressure production riser connectors. Several connector styles are available, based on the intended use and loads applied for the application. The Company’s FRC, PR-80™ and PR-85™, the OPT ZF2005 and NF2000 Riser Connectors along with its wellhead tie-back connector and radial bolt quick connections for surface production trees are included in its comprehensive Dry Tree Production Systems product line. This enables Dril-Quip to offer the complete drilling and production riser string for TLP and Spar Floating Production vessels. Dril-Quip offers drilling and production riser systems complete with universal riser spider and asociated running tools. 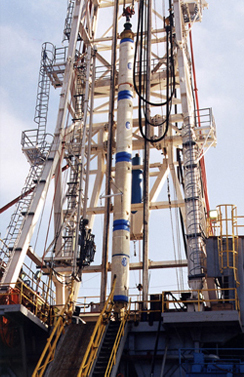 Dril-Quip offers a complete riser system for drilling operations conducted from floating production platforms. A key element of the system is the FRC riser joint connector. This, along with appropriately sized riser piping, form the basis of an outer barrier riser between the subsea wellhead and the drilling spool on the floating production platform to connect to the BOP Stack and maintain pressure control during drilling operations. Dril-Quip’s FRC Flanged Riser Connectors are preloaded connections suitable for use in TLP or Spar high-pressure drilling riser applications. Forged heavy-duty bolts are used to make up each connection and incorporate rings to retain the bolts in the "up" position during handling. A metal-to-metal sealing ring gasket provides a gas-tight connection. Dril-Quip’s FRC™ Marine Drilling Riser Connector combines high coupling strength with ease of operations and meets the stringent durability requirements of today’s deepwater and ultra deepwater drilling operations. Dril-Quip’s PR-80™ and PR-85™ and OPT ZF2005 and NF2000 Riser Connectors, along with its subsea wellhead system, wellhead tie-back connector and the radial bolt connector equipped surface wellhead system and production tree product lines, have enabled Dril-Quip to offer the entire production riser string for Spar and TLP Floating Production vessels. The PR-80 and PR-85 and the OPT ZF2005 forged, weld-on threaded connectors have the strength to resist high fatigue seen toward the upper and lower ends of production riser systems. The OPT NF2000 integral threaded connector is unequaled for its high strength fatigue-resistant, economical design for middle-distance riser joints connections that are not as highly stressed. Dril-Quip offers complete drilling and production riser systems available with universal riser spider and tensioning system to deploy and operate all production and drilling riser joints.